"41MR12, Burial III, 79" by Timothy K. Perttula and Robert Z. Selden Jr.
DECORATION: Engraved horizontal scroll motif repeated four times on the rim. Each of the scroll motifs are divided by vertical opposed engraved arcs. 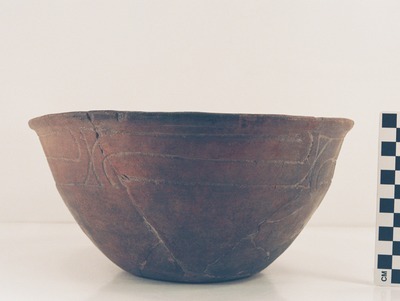 Ripley Engraved carinated bowl from Burial III at the Ben McKinney site.